Speed Cameras: There are more and more speed cameras in France (useful web site is controleradar.org/) They usually have a warning sign a few metres or so before you see the camera and it is often set on a dual carriageway in the central reservation to capture traffic on both sides of the road. They are much nearer to ground level than those found in Britain and Ireland. They are often located on motorways on more dangerous sections particularly when the speed limit is reduced to 110 kmh. Remember if you are driving a hire car your fine will be passed onto you by the car rental company. If you are driving on foreign plates, don't think you are safe from prosection now. A letter in the August/September 2007 edition of "The Riviera Reporter" concerned someone whose son had passed an Italian radar camera that flashed him. 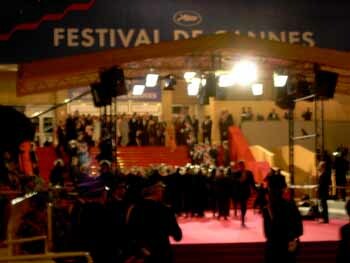 The fine was passed onto the French authorities to pursue via the local Prefecture. The same writer also knew of someone who had been speeding in Switzerland and the fine demand went overeas. 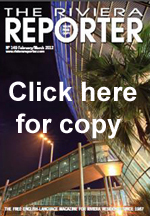 According to The Riviera Reporter "Harmanisation and intra-EU cooperation is under way and not only fines will have to be paid, but soon points will be deducted from your licence no mater where the offence was committed. This will include offences in the UK and any other EU country as well as Switzerland"
Road offences between Italy and France - Riviera Radio Daily News reported on the 8th January 2016 that a new measure has been introduced concerning road offences in France and Italy. Both countries will work together and as of the 1st of January all French motorists who commit a driving offence in Italy will receive a fine by post at their French address. 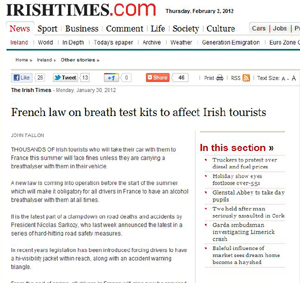 The same will apply to any Italian motorists fined in France. 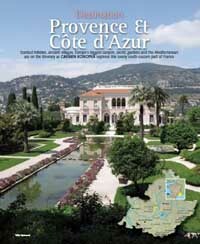 In the April /May 2011 edition of The Riviera Reporter "Speed cameras The proximity of an automated camera radar trap is no longer automatically posted in France. Instead, zones where such traps are common will usually be signposted as much as 2 kilometres in advance rather than the 400 metres previously. That leaves plenty of time to forget, so don’t. Over a thousand new speed cameras will be installed in France before 2012 adding to the 2800 already in place. More than 20 of these new cameras will be in Alpes- Maritimes including several in dense urban locations such as the Nice train station flyover"
Radar detectors After much debate, devices that detect speed cameras are now formally forbidden. In theory, using a device that actively warns of cameras is now punishable with a €1500 fine and the loss of six points. It is generally accepted that passive devices which show known speed camera positions without detecting them actively are acceptable if they are dubbed "danger zone warning devices". In 2012, 400 new fixed radar traps will be installed and there will no longer be advance-warning panels on roads equipped with them. 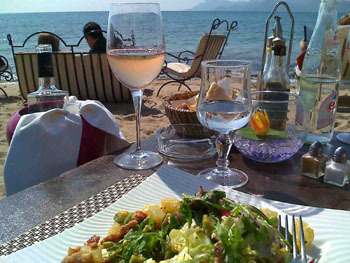 Environmental zones in France - Holidaymakers risk financial charges! 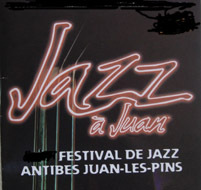 There is a new vignette/sticker for Paris, Lyon and Grenoble. They are first three cities to introduce emissions stickers for all vehicles and there are a lot of cities in France. Twenty two more cities are planning this. On days when certain cities are at risk of reaching their Euro emissions limit heavy polluting vehicles can be refused entrance based on the "Crit'Air" sticker the vehicle is displaying. You can apply on line and visit their website here Classifications are based on age of vehicle, there are quite a lot of restrictions for older vehicles. Presumably rental cars will be issued with these, but no doubt it could affect the hire costs as it another admin detail for them. 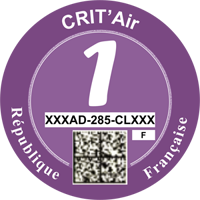 Motorists driving without the Crit'Air sticker can be fined on the spot from €68 to €135 It will be interesting to see if other cities in different countries follow this system. School buses must now be fitted with equipment that tests the driver's breath before allowing the vehicle to start. This is expected to be extended to include all buses within a couple of years. Police (including municipal police) can now test drivers for narcotics, including cannabis. Driving while under the influence of drugs is sanctioned like alcohol-related offenses. 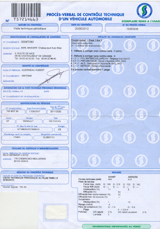 Contrôle Technique - A vehicle's first CT (MOT) must take place within 4 years of the1ère mise en circulation shown on the registration paper. The CT is then obligatory every 2 years for private vehicles and every year for vehicles registered to a business. Camping vehicles must now have a pollution test every year. When you are registering a newly acquired car the CT must have been done within 6 months of purchase if the vehicle is more than 4 years old. The contrôle technique 2012 looks at more items than previously and will take about 10 minutes longer and cost about €10 more. The speedometer must now be shown to function but its accuracy won't be tested. The horn must be in working order and its fixations will be verified. Brake fluid lines are now tested for cracks and potential leaks, as are power steering lines and fluid levels. Wheel bearings will now be checked for wear and excess play. Fog lights and rear windscreen anti-misting are now tested as well. Lateral body parts such as rigid decorative door guards must be firmly installed with no risk of them coming off and injuring someone. All doors must now function so that passengers can escape in case of accident or fire. The petrol tank must be in good condition and not leak. The anti-theft steering wheel lock will now be verified to ensure there is no danger of it locking while the car is in motion. The penalty for an outdated CT is €135 and results in immediate confiscation of the vehicle. The registration papers will be retained by police and you may then be granted a fiche de circulation provisoire allowing you seven days to get the car to a testing station. Once the car passes the CT, registration papers will be returned. Except for registered collectors' cars, even vehicles that are not used must now be tested although it's hard to see how this can be enforced. The new CT sticker shows the expiration date in much bigger letters than before so police can read it from a greater distance. A valid contrôle technique is the only accepted indication that your tyres, brakes, lights and other safety features were working properly at the time of an accident. Without an up-to-date CT you can be held responsible for an accident even if, in theory, it isn't entirely your fault. This isn't new but it's something too many drivers ignore. Drink and driving: Blood alcohol limit is 50mg - barely 1 unit of alcohol. (0.5 grams of alcolol per litre of blood) In the UK it is 0.8. Update January 2013 - From Total website - En cas de contrôle routier, le défaut de possession d'un éthylotest serait sanctionné par une amende de 11 euros à partir du 1er mars 2013. Un décret a été publié en ce sens au Journal officiel du mardi 30 octobre 2012. L'éthylotest donne un indice de la présence d'alcool dans l'air expiré. En France, Il est interdit de conduire en cas de concentration d'alcool dans l'air expiré égale ou supérieure à 0,25 milligrammes par litre. Source : service-public.fr. If you are stopped by traffic police, the lack of having a breathalyzer will mean you will be fined 11 euros from 1 March 2013 as per the decree that was published on Tuesday, October 30, 2012. The breath test gives an indication of the presence of alcohol in the breath. In France, it is forbidden to drive when alcohol concentration in exhaled air greater than or equal to 0.25 milligrams per liter. Source: service-public.fr. Drink Drive laws in Italy Update. Italy Magazine's March 2009 edition reports that the new Codice della Strada (The Highway Code) has stated that if you drink more than three glasses of wine or more than one brandy you will not pass Police alcohol tests. Apart from having the driving license suspended up to a year, the vehicle can also be confiscated and sold by the state. Take care if you are taking a day trip into Italy from the South Of France. Traffic on major roads has priority. Where two major roads cross, traffic coming from the right has priority as warned by the sign 'danger priorité à droite'. Where there is no sign, give way to the right. If a driver flashes his headlights in France, he is generally indicating that he has priority and you should give way. This can be confusing as in the UK it usually indicates that a car is usually indicates that a car is letting you out. Stopping for someone waiting at a zebra crossing is a fineable offence for holding up traffic. The crossings indicate where is best to cross. Do not overtake a tram when it is stationary with passengers alighting or boarding. Traffic lights don't show amber after red. Flashing amber means continue with caution. It is compulsory for front and rear seat occupants to wear seat belts if fitted. 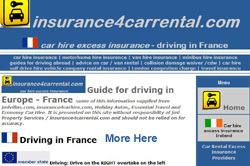 Driving Licence: A valid driving licence - If it is issued in the UK and the driver has passed his / her driving test at 17, you cannot drive a car in France till you are 18. The minimum age for car rental is 21. 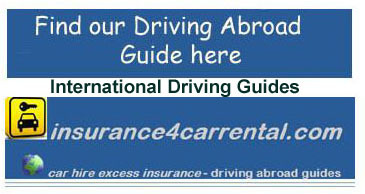 Motor Insurance: If your vehicle is registerd in the UK, you are not obliged to show an international insurance certificate or green card, however proof of insurance may be needed so take your insurance certificate showing fully comprehensive insurance. Vehicle Registration Documentation: Take your vehicle registration document with you, but don't leave it in the car (in case the car is stolen). If the car does not belong to you you should have a letter of authority from the registered owner and a copy of the registration document. Traffic Lights: Traffic light sequences are like those in Ireland, Spain, Belgium, Italy and many other European countries. They are unlike the UK in so much as when the light has gone red, instead of going to amber, they go straight to green. However they go from green to amber to red to stop traffic. You will often find that at night or at other quieter times some traffic lights flash amber from every direction. This means that no one has a right of way, but all drivers must proceed with caution. Seat Belts: It is complulsory to wear seat belts in front and rear and children under ten years old are not allowed to travel in the front seat (unless there are no seats in the rear). In the rear they must use a proper restraint system - bolster cushion. If you are driving with a dog, it is advisable to harness the dog in using a special dog harness. A dog like a human that is not secure in the back can cause serious injury(or death) to the front seat people if it is not secured by a harness. Motor cyclists: Motorcycles over 125cc must use dipped headlights during the day. A crash helmet is compulsory for driver and passenger. Motorways - Autoroutes: The motoway network in France is excellent. The majority of the country is covered by pay autoroutes and in most places they accept credit / debit card payments at the pay points (Tolls) Péage. 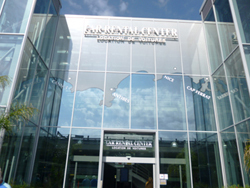 In many city areas the autoroute will be free in the zone around the city (not in Nice for example) and you will stop at a Péage to collect a ticket and stop at another at then of that section's toll road to pay. Most autoroutes are very well served by fuel stations, some with hotels. Approximately every 15 kilometres you will find an Aires - This is rest area with parking, tables and chairs for picnics and toilets, but no fuel. There are normally emergency telephones on the autoroute network every 2 km. These are orange and marked SOS. It is illegal to drive on a French motorway at less than 80km/h (approx 50 mph) in the fast lane. Fuel: Petrol - Essence | Unleaded - Sans Plomb (Green on pump handle)| Diesel - Gazole (Black on pump handle)| LPG - Gepel/GPL| Please note that most larger petrol stations will accept credit cards, however many of the automated ones will only accept a French one. Changes to French registration plates from 2009 - Black on White registration plates on French cars from 2009. From the 15th April 2009 the département number will no longer be on the French registration plate. The registration plates will no longer be black on white at the front and black on yellow at the rear as in the UK, but black on white on the front and rear as in Portugal, Ireland, Spain, Italy, Switzerland, Germany, Poland and many other European countries. They are made up of two letters, three numbers and two letters these are separated by hyphens(e.g. DE-354-FG) and will be allocated to a vehicle for life unlike presently if the owner moves from département to département. The new plates do not contain any element that identifies where the car owner lives.The Government claimed that this would facilitate police dealing with stolen or suspect vehicles. There was opposition from the suppression of department numbers (75,62,48,06 etc) on the registration plates and there was a Government climbdown. A car owner may add the official logo of their a French département to the their new style plate together with the département number below it on the right hand side of the number plate. This does not have to be the département where the owner lives. Second hand cars: The new regulations apply to second hand cars from the 15th June 2009 will get these as well when la carte gris (registration document) is updated with a new address or owner. If you are moving to France from another EU country uyou can keep your old British, Irish, German registration plates, but you must display where relevant Contrôle Technique. However if you are caught by a speed camera, don't think your foreign plates will help you.According to Transport Minister Dominique Bussereau the British are the worst followed by the Germans. Drivers will be tracked down to their French home address or via the home country of the registration plate. Speed limits in France: Don't put yourself in the frame Stick to the speed limit in France, warns Chris Dearden of The Independent – foreign motorists are being targeted - October 2010 "a gendarme on his BMW motorbike overtook us and gestured for us to follow. Half a mile later, we turned in and parked alongside a dozen other cars, all caught in the same speed trap -My friend's on-the-spot fine had been €90, but a Dutch Audi driver had been relieved of €700, courtesy of a nearby cash machine. Working on an average fine of, say, €250, and 20 cars an hour, 10 hours a day, that speed trap could be pulling in €18m a year. 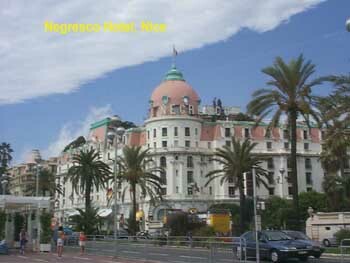 According to the letter section of The Riviera Reporter (December 2008/January 2009 edition) A Monaco resident reported "I've just been told that Monaco registered cars can only be driven by the owner. This means that I can't allow my car to be driven by visiting friends or family as apparently they would't even be insured". The Riviera Reporter reply. "This stems from a modification to the highway code dated April 2008. 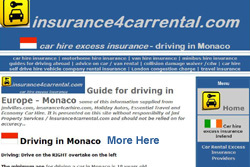 According to insurance broker Eric Blair, who is in a better position than anyone to know the details concerning this situation, the new rules mean that any Monaco registered car can only be driven by the owner, their spouse/husband and children as they are declared Monaco residents and therefore "Carte de séjour" holders. 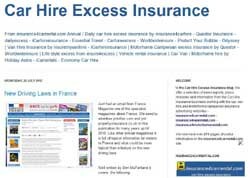 Insurance wise, the policy could be considered as "nul and void" on the basis that if the driver at the time of an accident did not comply with local law, them the driver would be unauthorised to drive." The Riviera Reporter goes on to say "Eric is raising this matter with the Insurance Brokers?Agents Association to obtain their position. When The Riviera Reporter knows more they will print it. Richard Sharpe was driving out of the Mone Carlo casino carpark and heading for the A8 autoroute. He misread the road and went through a red light. He was pulled over by a policeman who demanded an on the spot fine of one hundred and fifty euros in cash. He was told that unless he paid the money immediately the car would be impounded and he and his wife would not be allowed to leave Monaco. They had to go to an ATM to obtain the cash and pay it over. A receipt was issued. 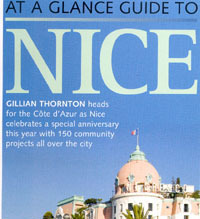 Another reader of The Independent Craig Brand reported in the 29th May 10 edition of Independent Traveller that after watching the Monaco Grand Prix, he left to go to Nice. He came to a roundabout and was confused by the road signs and ended up going down a one way street. Police immediatelt pounced and issued a €60 fine. 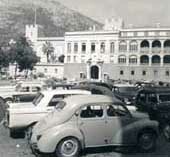 Take great care when driving in Monaco. It could prove rather expensive. Telephones in France - Mobile phones - All mobile phones start with 06. Calling a mobile from a land line can be very expensive. If you are visting France for a while instead of relying on your home country mobile you can buy a "nomad" Pay as you go sim card. You will need a French address. Landline phones - The French telephone network is run by France Telecom. Peak hour (heures pleines) rates run from 8am - 7pm Mon-Fri. The weekends, national holidays & hours between 7pm & 8am are classed as off peak (heures creuses).